* The special promocode of Rs.400 will be received post purchase of this deal. * Use Promocode MOVIEDEAL100 while purchasing deal to get Rs.100 Instant Cashback. * Discounted promocode is valid till 9th February. 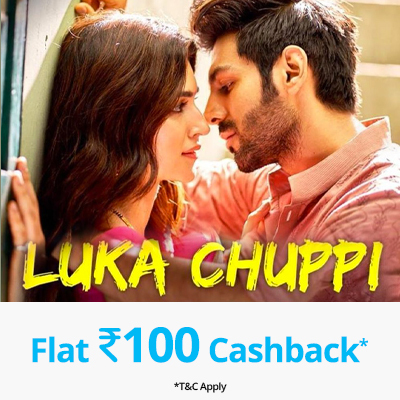 * Discounted promo code is only applicable for booking Luka Chuppi movie tickets on Paytm.com and Paytm App. * The cashback of Rs.100 on the deal will be credited in your Paytm wallet within 72 hours of booking tickets. * The discounted promo code will be applicable on booking Luka Chuppi Movie Tickets only (once booking starts).